for Unique Dream Holidays in the Heart of Tuscany! 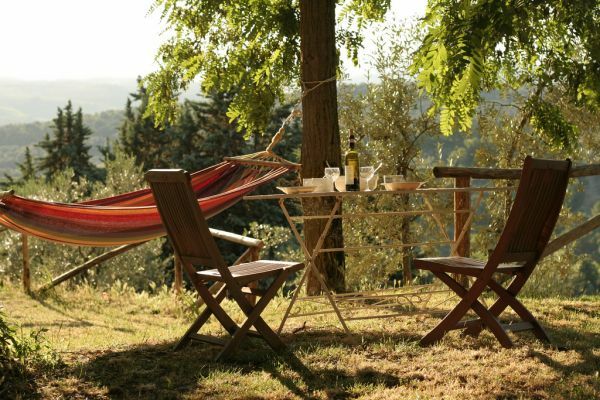 Ancora del Chianti Bed and Breakfast and Retreat in Tuscany is near Florence and Siena, hilltop with breathtaking views and immersed in nature. 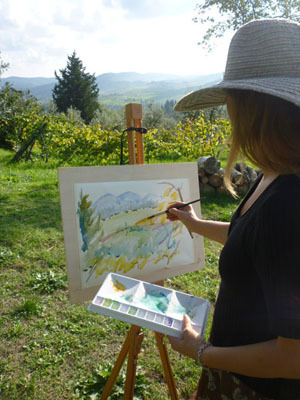 Chianti is one of the best places to stay in Tuscany for wine country lovers and artists for its beautiful landscapes and local products. In the heart of the Chianti Classico region, among the vineyards, cypress trees and olive groves the farmhouse Bed & Breakfast Ancora del Chianti B&B in Tuscany and Art Yoga Retreat operates as bed and breakfast accommodation for couple, families, small groups and solo travellers, as art and yoga retreat location for teachers, coaches, trainers and tour leader with their group and as art residency alone or with friends and family, featuring comfortable rooms, tasteful breakfasts, a luminous studio in a blissful setting, free WIFI and communal kitchen for guests free of charge. The property is also surrounded by a large garden with beautiful plants and flowers. Ancora del Chianti Bed and Breakfast is only 5 km outside the town of Greve in Chianti and only 20 km from Florence and 40 km from Siena, centrally located in Tuscany. Leaving the main road SS22 in Greti you drive up on the hilltop following "Ancora del Chianti Bed and Breakfast" white signs on a country dirt road for just 2 km (5 min). While driving you will meet the Chianti vineyards, cypresses and the unforgettable profile of the Tuscany hills. The central location of the B&B between the Tuscan cities of art and point of interest, and therefore an ideal base for those wishing to explore Tuscany. A local bus service provides a convenient direct link between Greve in Chianti and the centre of Florence, offering the possibility to reach Florence easily, avoiding any problems with traffic or parking. where the frenetic pace of life can slow down, allowing guests to re-adjust to their own rhythm and to simply rejuvenate. Guests can benefit from the simple delight of a silent morning stroll before enjoying a varied and abundant breakfast in a pleasant and relaxed atmosphere, where experiences and tips can be exchanged with other guests and new acquaintances can be made. 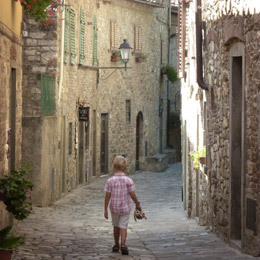 The day may continue with visits to some of the most famous cities of art, medievial villages, working farms and nearby castles, losing oneself along the country lanes with unforgettable views, to then venture into the rich world of food & wine that the local land offers. At sunset, the garden offers a moment to relax before dinner in one of the numerous restaurants in the area, known for the quality of their cuisine and their warm hospitality. On returning, the stars will light the way to your room where a comfortable bed and an undisturbed sleep complete a day of discovery and emotion, accompanied by the gentle sound of crickets. Why Ancora del Chianti B&B? the pleasure of sharing their reports with you.